Video game stocks have suffered a massive blow over the past few months, although that hardly makes the industry unique. 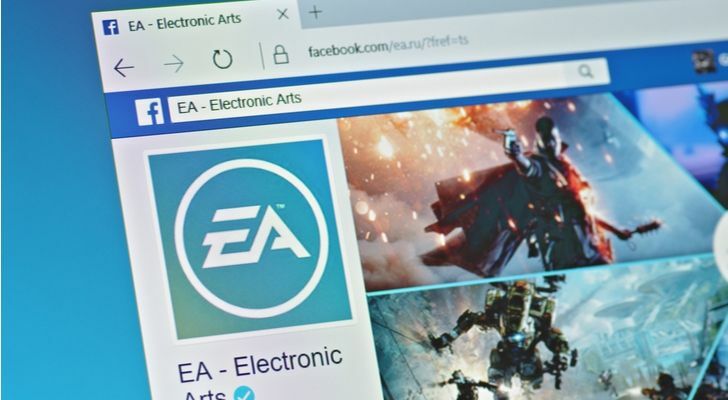 Plenty of names have suffered at the hands of the market’s correction, but the beating in names like Electronic Arts (NASDAQ:EA) seems especially harsh. EA stock is down almost 50% from its highs just five months ago. After a halving of the stock price, surely long-term investors are starting to look at EA stock on the long side. Tempting as it may be though, I believe other stocks are more attractive after suffering their own beatings. While we could opt for balance-sheet titans like Apple (NASDAQ:AAPL) and Alphabet (NASDAQ:GOOGL) at 30% and 20% off their respective highs, EA’s peers look attractive too. I’m talking about names like Take-Two Interactive Software (NASDAQ:TTWO) and Activision Blizzard (NASDAQ:ATVI). Both of these names have also been under pressure, falling 26% and 45% from their 2018 high, respectively. With its $23 billion market cap, EA is far larger than Take-Two and its $12 billion market cap. Both are dwarfed by Activision’s $36 billion market cap. When EA reported Q2 earnings in October, the company crushed expectations. However, guidance for Q3 and the full year came up short of expectations. That put investors in a sour mood, as they pushed the stock even lower. As it stands, analysts are now looking for earnings of $4.57 this year, up just 3.5% from the prior year. On a revenue basis, analysts are looking for just 60 basis points of growth this year. Overall, it’s unimpressive. But with that being said, shares now trade at 17 times this year’s earnings. On a trailing basis, EA stock is nearing the bottom end of its three-year price-to-earnings (P/E) range, which bottomed out around 22 times times earnings. Currently, shares trade at about 25 times trailing earnings. So why should we consider TTWO over Electronic Arts? I don’t doubt that any of the major game-makers had a massive holiday season. All of the data for online sales has been stellar and video games are always hot sellers around the holidays. But TTWO released arguably one of this year’s biggest games, that being Red Dead Redemption II. It’s also got NBA 2K18 and Grand Theft Auto V, the last of which remains a top seller despite being released five years ago. Put simply, TTWO is going to crush it this holiday season and that momentum will likely continue into 2019. And at 20 times this year’s earnings, the valuation isn’t enough of a factor go with EA over TTWO. That said, EA does have decent growth expectations for 2019, with estimates calling for 6.6% revenue growth and 12% earnings growth. Still, I like TTWO more. EA is under pressure as other companies have larger game releases this holiday season. That being said, it’s down almost 50% from its highs and has underperformed both ATVI and TTWO. Those who are looking at a long position may consider a basket approach to the trio, taking advantage of diversification in a secular growth industry. If that’s the case, when should investors buy EA stock? $80 was holding up as support, but downtrend resistance (blue line) eventually pushed it lower. On Wednesday, EA stock hit new 52-week lows. Down 11 of the last 12 weeks though and we’re certainly in oversold territory. 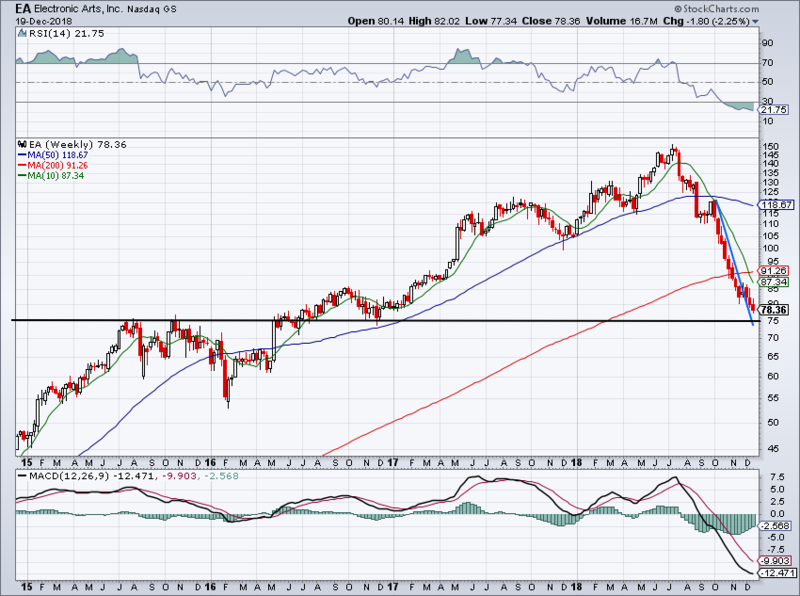 The stock is trading with an RSI reading of 21 on the weekly chart as EA stock approaches the critical $75 level. It’s also a positive development that EA cleared downtrend resistance. 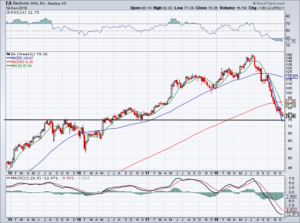 As a long-term investor, I would consider buying a bit of EA near this level. At this level, EA will be down 50% from its highs. Granted, I wouldn’t bet the farm on it, but it’s a reasonable-risk play at these levels. A break below will thrust EA stock even lower. On a rebound, look for an eventual test of the 10-week and 200-week moving averages. Bret Kenwell is the manager and author of Future Blue Chips and is on Twitter @BretKenwell. As of this writing, Bret Kenwell is long AAPL and GOOGL. Article printed from InvestorPlace Media, https://investorplace.com/2018/12/time-to-buy-ea-stock/.